Since my step daughter visiting us for her summer break, I’m making a lot of snack for her. She is a growing up kid, so she needs lots of nutrient. She loves Asian food, especially Bulgogi, Galbi (Korean BBQ) and Rice Balls. 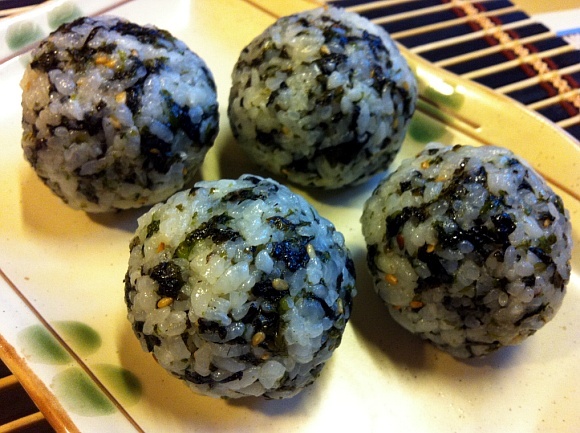 Her favorite Rice Ball is tuna and pepper corn ranch. Originally the filling made with tuna and mayonnaise mixture. But I made with pepper corn ranch one time, and it was so good!! Trust me, I don’t like ranch AT ALL. Not even a bit. But in this recipe, it is a BOMB! This is how I normally make at home. Triangle shape, small piece of seasoned dried seaweed. Combine tuna and cracked peppercorns ranch in a small mixing bowl. 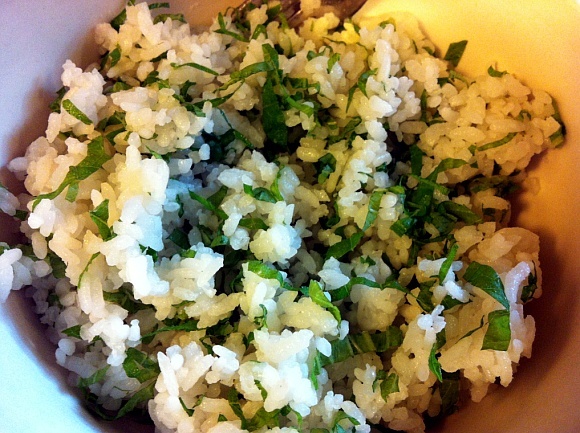 Take 1/2cup of rice in your left hand and gently press middle of the rice to make an indentation. 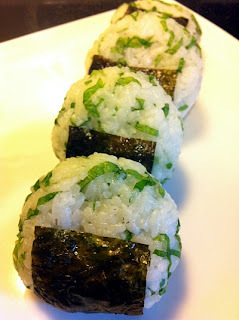 Put 1 Tablespoon tuna and ranch mixture into the center, carefully close the rice over the filling so it becomes covered. Squeeze gently, but hard enough to hold it together, and mold it into a triangular shape. Wrap with seaweed only one side of the triangle. Tips: Wear disposable poly gloves or wet your hands to avoid the rice sticking on your hands. 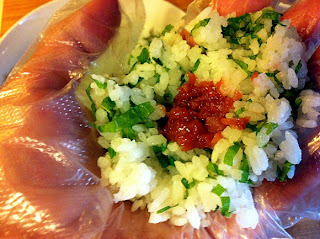 Wrap individually with plastic wrap if you are not serving right away or for lunch box. 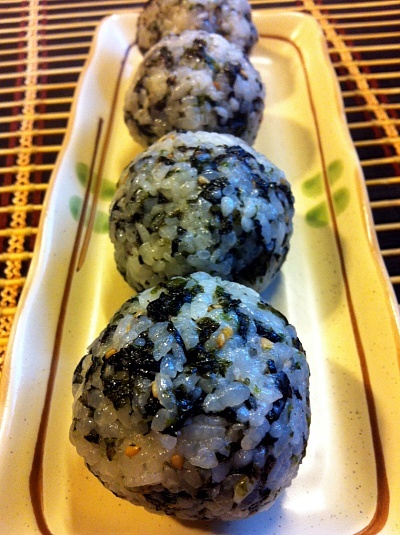 1cup rice + 3/4cup crumble, seasoned seaweed. It’s crumbled not a sheet. It is really good by itself as a snack. Crunch, salty, sweet and nutty. It can be topping for other Korean food, like Bibimbap or Banquet Noodles. All brands are a bit different taste, like some more saltier, some more sweeter. This one I used today, was very crispy and crunch as the package says, (^-^) and also pretty sweet than the other brands. 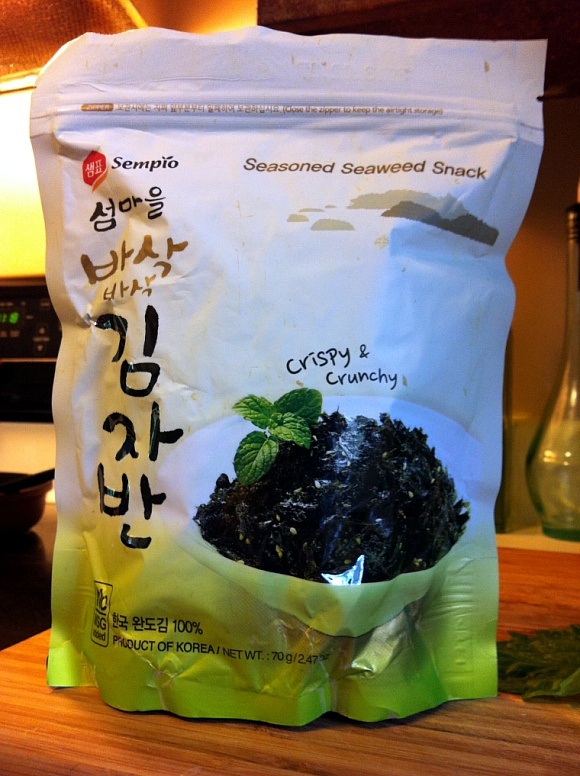 I like more salty seaweed but it worked out perfectly for my step daughter though! 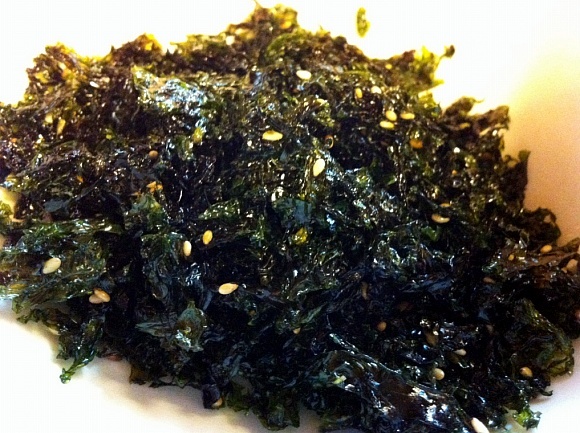 It has sesame seeds and oil so it gives very good flavor to food. I also made Umeboshi (Japanese Pickled Plum) and shiso rice balls. It is very very salty! And it has very very great flavor!! Click the follow link to read more about Umeboshi! This is how shiso looks like. It’s Japanese herb, type of perilla. But don’t be confused, it is totally different flavor than Korean perilla. 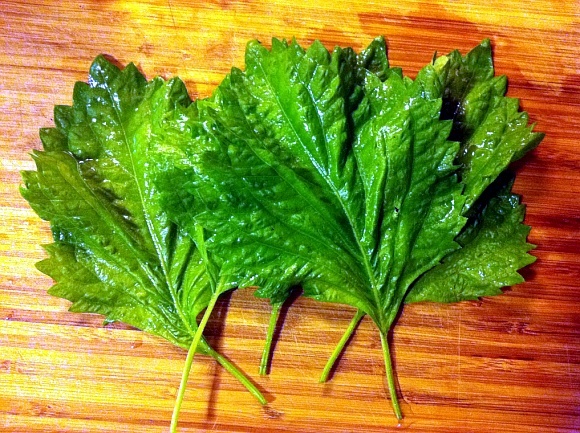 Shiso has a hint of liquor-icy and kind if nutty flavor. I grow my own shiso at my garden. Luckily my kind Japanese friend shared 2 plants of shiso with me last year, and I’m having 5 plants this year! Yay~ for me! There are more varieties of shiso. Click the follow link to read more about Shiso! 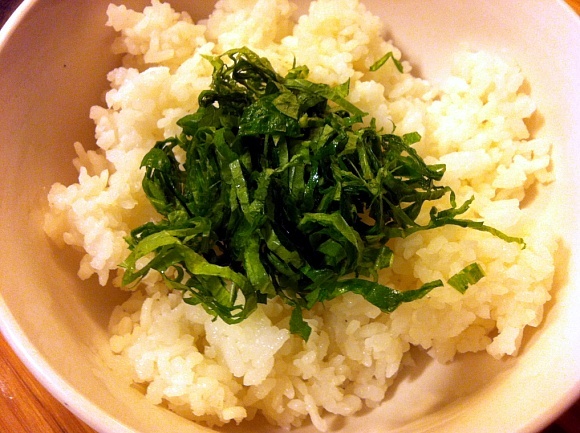 In a mixing bowl, 1 cup of rice and 3 leaves of shredded shiso, combine well. Remove seeds and chop 2 Umeboshi. Take 1/2cup of rice and shiso mixture in your left hand and gently press middle of the rice to make an indentation. 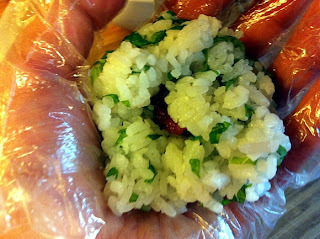 Put 1/4 of chopped Umeboshi into the center, carefully close the rice over the filling so it becomes covered. Squeeze gently, but hard enough to hold it together. 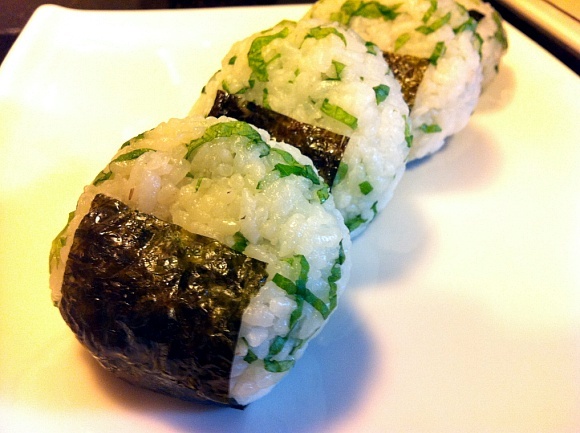 Wrap with seaweed only one side. 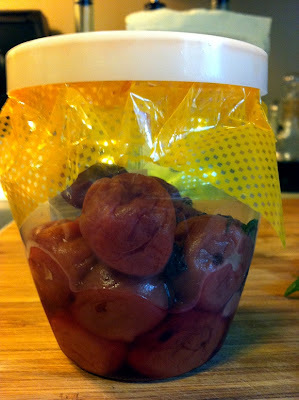 I made these today for a snack for my hubby and daughter. They went softball game, and as I knew, came back home very hungry. It was gone in 5 minutes! They loved it!! I’m so happy and grateful to have my family. Sometimes we are going though hard time, but as many hard times as we are going though, we become more strong together! Jacob & Trinity, I love you, and thank you so much. 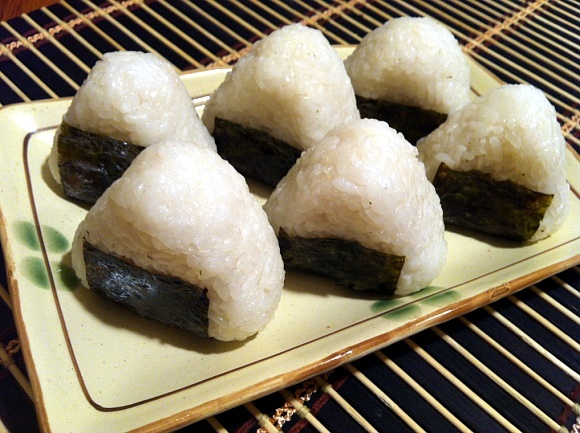 I love making onigiri for lunches. I have made some for my family and I think I may make some for myself next week for work. They are easy and inexpensive to make. Plus they are so filling and you can pretty much fill them with anything too. You got it girl! ^-^ There are no rules!